Afton Morrison, our narrator, has a problem -- she has this drive to kill someone. Multiple someones, actually. She's not a female take on John Wayne Cleaver, though. She's really at peace with the idea (as much as you can be). She wants her targets to be deserving (in a Dexter kind of way), and she wants to get away clean, so she can do it again. This isn't your typical take on a Children's Librarian from a small town public library, but, hey -- maybe it should be. She's found her first victim, follows him, knows his habits, is sure he's the right guy and is all set to make her move. . . but can't seem to find him when the time comes. Meanwhile, she's got to play supportive and attentive little sister to her brother who's having trouble with his love life. She's an unwilling mentor to a would-be over-achieving high school student. Plus, Afton's finding herself with new and unexpected interpersonal connections -- none of which she has time for, because he's got to go kill a man. As soon as she finds him. Also, other complications ensue -- Afton may have a well-conceived plan, but she's going to have a really hard time sticking to it once other people get involved. I like Afton -- as much as you can like someone like her. Her brother's great, ditto for all the other complications in her life -- good characters, and (generally) good people. I hope we can find out more about Afton and most of the secondary characters (there's a couple I'll ignore for now for spoiler reasons). The writing could be tightened up a little bit. A couple of errors fixed -- and I'm going off of an ARC, it's possible they will be in time for the publication. I think some of the language used by a some of the characters (see Peter, a fellow librarian, in particular) goes over the line -- he can be a creep, but when you make him that much of a creep, he becomes a liability. "Can we just spend time with the would-be murderess? I don't feel quite so dirty reading about her." But on the whole, the storytelling itself is strong enough that it makes up for whatever deficiencies one may find in the text. A personal note to Mr. Jones: If you don't stick to your schedule on the following installments, so I have to wait to find out what happens, I'll...I'll, I dunno. Tweet nasty things about your mother. Just sayin' -- I need to find out. A fast, fast read that grabbed me from the first chapter and wouldn't let me go until the end. And even then, it left me wanting more -- soon. Thankfully, Jones has his 4-part series scheduled to wrap up this October. 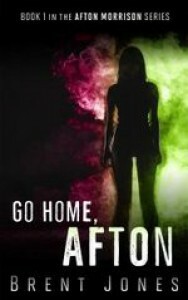 Go Home, Afton is as entertaining as it is intriguing with a protagonist you want to get to know better (even if she's someone you'd like to see locked up in a treatment facility for at least a few years). So, Afton is a great unreliable narrator. She's not trying to be one -- which is the best part. She's reporting things to us as she sees them, but she can't trust what she's seeing and hearing. Which makes the reader pretty sure they know what's going on most of the time -- but they can never be totally sure.Thankfully, Afton is pretty up front about this. Neither she nor Jones are trying to play games with the reader. I can get behind that.